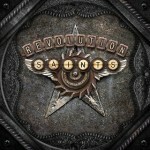 Share the post "Album review: REVOLUTION SAINTS – S/t"
Another project put together by Frontiers, this time featuring Journey’s drummer Deen Castronova, Night Ranger’s Jack Blades and former Whitesnake guitarist Doug Aldrich. Add to this superstar trio Frontiers ‘go to’ man for melodic rock projects Alessandro Del Vecchio, who provides the keys, songwriting and production. On this album Deen Castronova handles most of the lead vocals, lending it a real Journey feel to the music at times, particularly on the ballads like ‘Don’t Walk Away’. You can see why he does a lot of the live harmonies for Journey as he has a rich, melodic vocal. Speaking of Journey, vocalist Arnel Pineda duets on the massive slab of melodic rock that is ‘You’re Not Alone’, both vocalists complement each other very well. It could easily have been lifted of the last couple of Journey albums. Not to be outdone fellow Journey band mate Neal Schon guests on ‘Way To The Sun’, which judging by recent interviews maybe the nearest we have Schon playing on a Journey-like song for some time. ‘Turn Back Time’ is the lead song of the album and rightly so as it roars out of the blocks, with Doug Aldrich letting fly with some tasty riffs. If that wasn’t enough, there is a cracking vocal trade off between Castronova and Jack Blades, the nearest to a Night Ranger song on here. Another classy hard rocker is ‘Back On My Tail’, featuring some monster Aldrich riffs (he never goes too flash on the solos yet gives the songs that extra touch of class) and another chorus that won’t leave your head. This entry was posted in ALBUM REVIEWS, ALBUM REVIEWS (Mobile), All Posts and tagged album, Alessandro Del Vecchio, AOR, Arnel Pineda, Dean Castronova, debut, Doug Aldrich, Jack Blades, Journet, melodic rock, Neal Schon, Night Ranger, review, Revolution Saints, rock, Whitesnake. Bookmark the permalink.